The original Sennelier shop is located on the Quai Voltaire across from the Louvre and just a few steps away from the Ecloe des Beaux Arts of Paris. Sennelier has been a famous name with a tradition of quality products since 1887. In this shop Gustave Sennelier mixed the colors for students and such painters as Cezanne Soutine and Gauguin. Today Sennelier is the place for not only Parisian artists but those from all over the world.Sennelier offers our largest line of pastels with a beautiful range of colors. Sennelier achieves their softness by drying them in the traditional way; in the open air for up to four weeks. Senneliers selection begins with pure pigments chosen for their intensity and light-fastness. These colors are then tinted up to ten graduations per color producing the widest range available in the world. 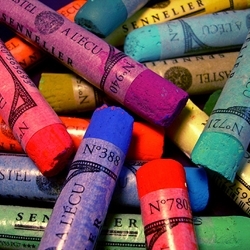 Sennelier is one of our most popular pastels due to its uniform softness and incredible range. Still manufactured by hand in the French tradition of the 1800s.